I love vintage! Pictures of old barns and weathered boats came to mind when I created this card. With grey textured wood, vintage polaroid type image and pop culture accents... adding a dash of bling... it came together as a Picture of Happiness! 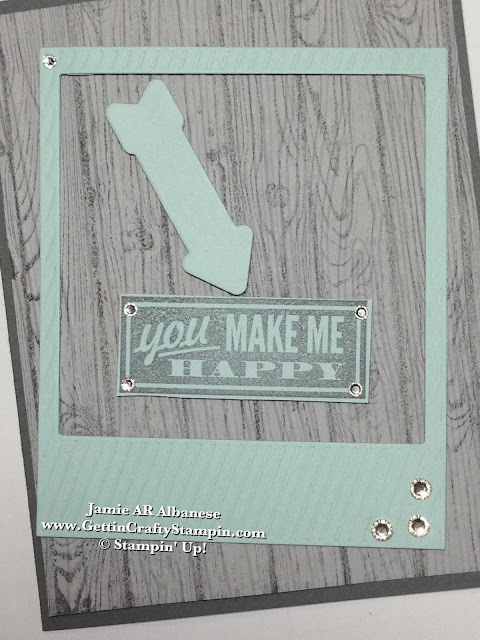 This hand-stamped, embossed card is fun and easy to create with die-cut Framelits and my Big Shot. Join me in creating and sending some vintage happiness! Paired together with the aide of my Color Coach (#130118) this combination of Basic Grey and Smoky Slate are monochromatic mates. The cool addition of the Pool Party card stock for a vintage vibe in this card. I love adding texture to a card! Embossing with the aide of my Big Shot, the On Film Framelit has an automatic die-cut and embossing feature. 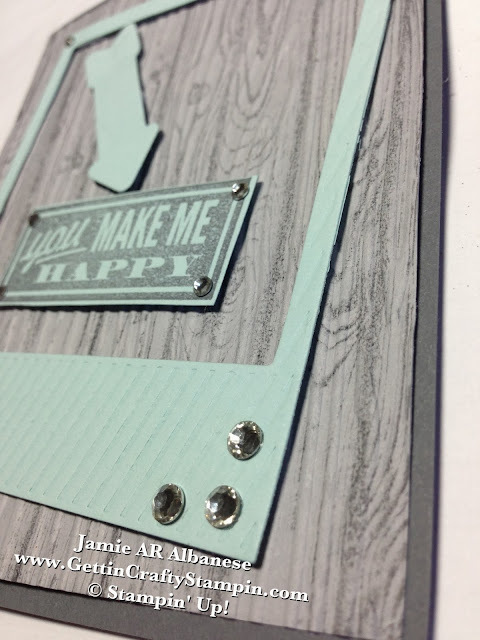 Using the Woodgrain Embossing Folder to create a wood feel on this Basic Grey inked Hardwood stamped Smoky Slate card stock. Adding bling to this rustic, vintage, hand-stamped and embossed card is easy! Our adhesive backed Rhinestone Jewels are a great addition! With 150 per sheet, in three sizes, you can have a variety of shapes while looking cohesive! The texture has a subtle effect but that really makes the card!! The pattern may not match up but the wood texture adds to the Hardwood stamped page for a rustic, distressed look and feel. Using the On Film Framelit and Pool Party card stock this mock-polaroid image pops out. Raised above the textured 'wood' with the Stampin' Dimensional adhesive. The thin top is ideal to cut and use the side strips of the Stampin' Dimensional adhesive. Less waste and using the side gives me more options when you have thin or smaller images that you want raised! 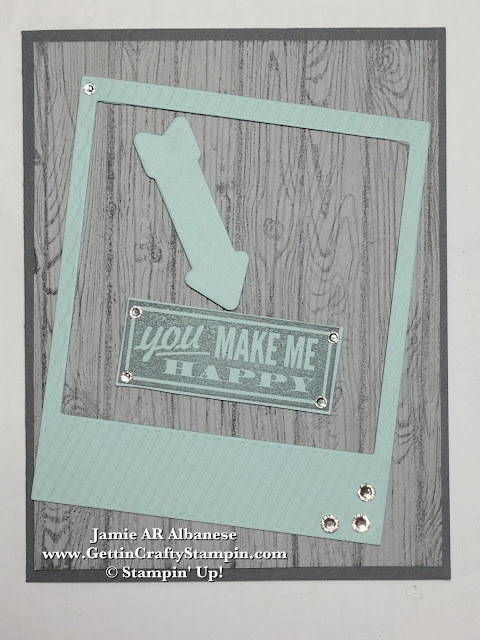 The center of the frame is popped out and becomes what I used to stamp the 'You Make Me Happy' sentiment from the Hello Lovely stamps set. Using the Basic Grey ink keeps the color vibe of this embossed and hand-stamped card. This same piece of card stock is ideal to use for this trendy arrow (arrows are all the rage, right now). Less waste when you use the strips and scraps for a happy card that makes a big impression! Send a vintage, rustic, embossed, hand-stamped card that is sure to impress! embracing the fun of pop-culture, this vintage card has an aged look and texture with fun vintage polaroid accent and a fun pop of sparkle. Join Me in sending a vintage hug and smile with this Picture of Happiness hand-stamped, embossed card (it's way easier than sending an old barn, lol).